Shares of semiconductor companies around the world rose last Thursday after U.S. chipmaker Micron Technology Inc. (MU) said a recovery in the memory market will occur later this year. Despite declining demand for smartphones, Reuters reported analysts at JPMorgan (JPM) expect growth to be fuelled by investments from data center customers and more memory content in phones. As a result, investors may want to consider investing in semiconductor stocks that are trading below Peter Lynch value. A legendary investor, Lynch developed this method in order to simplify his research process. With the belief good, stable companies eventually trade at 15 times their annual earnings, he set the standard at a price-earnings ratio of 15. Stocks trading below this level are often good investments since their share prices are likely to appreciate over time, creating value for shareholders. The GuruFocus All-in-One Screener also looked for companies with a business predictability rank of at least two out of five stars and a 10-year revenue growth rate of at least 6%. As of March 25, stocks that met these criteria were Intel Corp. (INTC), Micron Technology and Skyworks Solutions Inc. (SWKS). 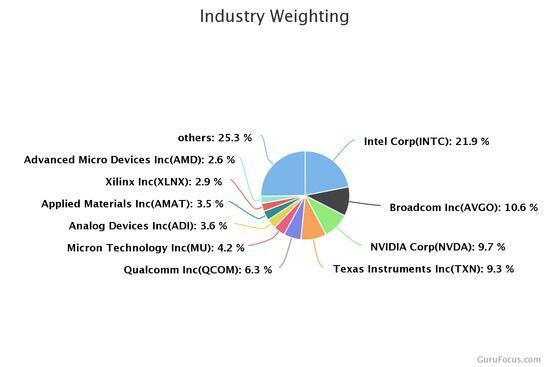 According to the industry overview page, Intel and Micron are among the largest players in the semiconductor space, along with Broadcom Inc. (AVGO), Nvidia Corp. (NVDA), Texas Instruments Inc. (TXN), Qualcomm Inc. (QCOM) and several other companies. 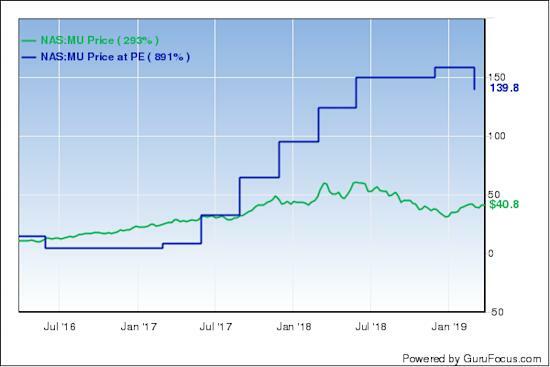 The Santa Clara, California-based semiconductor manufacturer has a $237.13 billion market cap; its shares were trading around $52.73 on Monday with a price-earnings ratio of 12.89, a price-book ratio of 3.18 and a price-sales ratio of 3.50. GuruFocus rated Intel's financial strength 7 out of 10. In addition to having good interest coverage, the Altman Z-Score of 4.54 indicates the company is in good fiscal standing. The company's profitability and growth fared even better, scoring a 9 out of 10 rating. Not only is the operating margin expanding, but Intel has strong returns that outperform competitors, consistent earnings and revenue growth and a high Piotroski F-Score of 8, which means business conditions are healthy. The tech giant also has a 3.5-star business predictability rank. According to GuruFocus, companies with this rank typically see their stocks gain an average of 9.3% per year. Of the gurus invested in Intel, Ken Fisher (Trades, Portfolio) has the largest position with 0.56% of outstanding shares. Other top guru shareholders include PRIMECAP Management (Trades, Portfolio), Pioneer Investments (Trades, Portfolio), Bill Nygren (Trades, Portfolio), Lee Ainslie (Trades, Portfolio), Michael Price (Trades, Portfolio), Chris Davis (Trades, Portfolio), Jeremy Grantham (Trades, Portfolio), Ray Dalio (Trades, Portfolio) and Joel Greenblatt (Trades, Portfolio). Headquartered in Boise, Idaho, the company, which produces semiconductor memory chips, has a market cap of $45.31 billion; its shares were trading around $40.78 on Monday with a price-earnings ratio of 4.40, a price-book ratio of 1.35 and a price-sales ratio of 1.64. According to the Peter Lynch chart, the stock is undervalued. 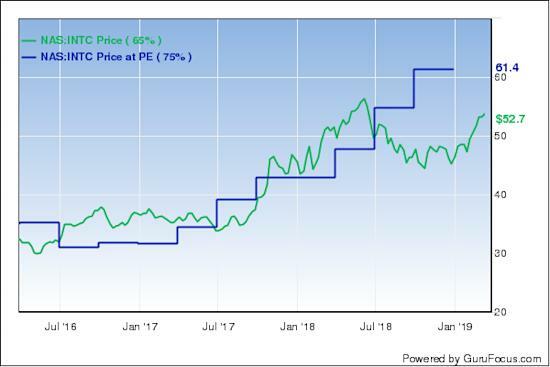 Driven by adequate interest coverage and a robust Altman Z-Score of 4.99, Micron's financial strength was rated 8 out of 10 by GuruFocus. The company's profitability and growth scored a 9 out of 10 rating. In addition to operating margin expansion, Micron is supported by strong returns that outperform industry peers and predictable earnings and revenue growth. It also has a high Piotroski F-Score of 7 and a 3.5-star business predictability rank. With 5.16% of outstanding shares, PRIMECAP is the company's largest guru shareholder. Other major investors include David Tepper (Trades, Portfolio), Donald Smith (Trades, Portfolio), Pioneer, Jim Simons (Trades, Portfolio)' Renaissance Technologies, Greenblatt, Dalio, Steven Cohen (Trades, Portfolio), Mohnish Pabrai (Trades, Portfolio) and Yacktman Asset Management (Trades, Portfolio). The semiconductor manufacturing company, which is based in Woburn, Massachusetts, has a $10.46 billion market cap; its shares were trading around $80.77 on Monday with a price-earnings ratio of 13.50, a price-book ratio of 3.48 and a price-sales ratio of 3.87. Skyworks' financial strength and profitability and growth were both rated 9 out of 10 by GuruFocus. As a result of having no long-term debt, it has a comfortable level of interest coverage. The high Altman Z-Score of 15.63 suggests the company is in excellent financial health despite recording a slowdown in revenue per share growth over the last 12 months. The company is also supported by an expanding operating margin, robust returns that outperform competitors and a moderate Piotroski F-Score of 6, which indicates business conditions are stable. Skyworks also has a perfect five-star business predictability rank. GuruFocus says companies with this coveted rank typically see their stocks gain an average of 12.1% per year. 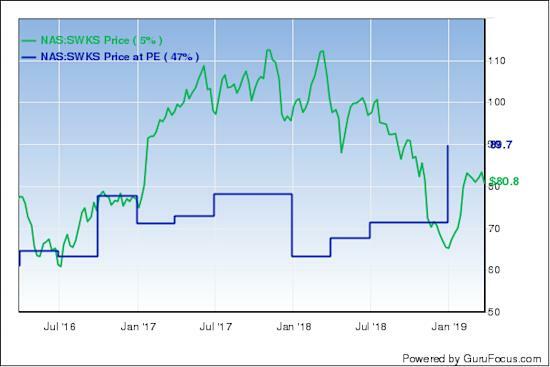 As of March 25, Skyworks also made the Undervalued Predictable Screener, which takes discounted cash flow and discounted earnings into account along with high business predictability ranks. Simons' firm is Skyworks' largest guru shareholder with 0.48% of outstanding shares. Dalio, Richard Snow (Trades, Portfolio), Pioneer, Paul Tudor Jones (Trades, Portfolio), Greenblatt, John Hussman (Trades, Portfolio), Caxton Associates (Trades, Portfolio) and Scott Black (Trades, Portfolio) also have positions in the stock.